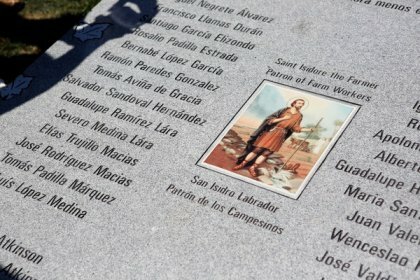 A new grave marker names the Mexicans who died in an airplane crash at Los Gatos in 1948. Some of us are illegal, and some are not wanted, Our work contract’s out and we have to move on; Six hundred miles to that Mexican border, They chase us like outlaws, like rustlers, like thieves. We died in your hills, we died in your deserts, We died in your valleys and died on your plains. We died ’neath your trees and we died in your bushes, Both sides of the river, we died just the same. In 1882, Congress passed the Chinese Exclusion Act, one of our nation’s first immigration laws, to keep out all people of Chinese origin. During the “Red Scare” of the 1920s, thousands of foreign-born people suspected of political radicalism were arrested and brutalized. Many were deported without a hearing. The next bullet point would read: After 9/11, government programs target Muslims, exclusively, for detainment. Detainees and deportees are in the same struggle. In a country built upon immigrants, we have a systematic way of stripping them of their rights and denying them of their humanity. Nice article, always good to see Woody Guthrie mentioned. I wish I knew. Other than doing a better job of teaching history, I don’t know much else. Maybe we could use some of the strategies to reduce bigotry, used in the SPLC’s teaching Tolerance Program? That’s a disturbing conclusion. What can be done? Unfortunatly, as long as people profit from these things it will continue, they’ll sell ad revenue on TV warning people about the “Big Brown Menace” to sell security cameras and hire more people to watch for “Scary Brown people” at airports and train stations. Sad but true. At one point there was wide spread discrimination against Catholics in the country, yet today one of our most prominent anti Muslim hate Mongers is Robert Spencer, who is a Catholic. Same is true for Jews, except even more so, and we all know about the horrors of the Holocaust, but there are plenty of Jewish Islamophobes out there. For all we know we know, after all the Islamophobia has died down, a Muslim maybe a prominent propagandist in the next major wave of persecution of a minority group in America. *sigh* and time marches on… most reasonable people want reform, but it’s hard to find an answer that satisfies everyone…what should be done and what can be done? When will we ever learn from history and stop repeating it?